I love ribs– but really, what non-vegetarian doesn’t? I’m partial to the ribs from Kansas City, where I have family. Spicy, but sweet and sticky. I don’t get back very often, so I’ve put together a simple recipe. I start with the oven, then finish on the grill (with smoke-infusing wood chips). It’s not the most authentic, but it works in a pinch. 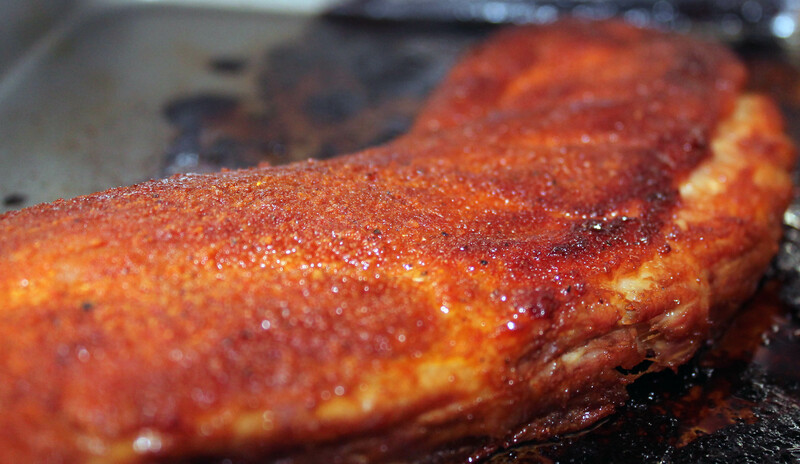 ** I find it’s best to get a good cut of pork side ribs and cut off the large chunks of fat before you start. Rub into ribs. Put in a pan, and cover with foil. Bake for at least an hour. Soak the wood chips according to directions. If they ribs don’t look cooked enough to eat, keep them in the oven longer. Pack wood chips in foil with holes in the packet. Put in the bottom of the grill. Turn on grill, cover and let the chips start heating up. It should take about ten minutes (unless your chips say otherwise). Mix 1 part honey to 2 parts BBQ sauce. I usually end up with around 2/3 cup total. 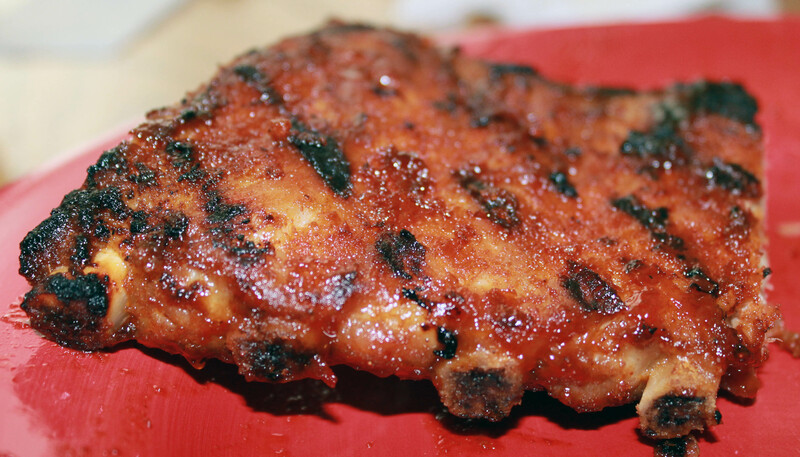 Slather ribs with sauce and place on the grill, meaty side up, medium heat. Leave for about 5-10 minutes, depending on how sticky vs. saucy you like your ribs. Flip over and leave for the same amount of time. A little bit of classic Canadian rock, an a fabulous live band– The Tragically Hip. One of my favourite places in the world is Jamaica. Beautiful landscape, friendly people and tasty, tasty food. Just hours after we landed in Montego Bay, we grabbed some jerk chicken and pork at a local joint The Pork Pit and I loved it. I love spicy food. Some people find adventure and thrills in skydiving; I find it in fiery food. After that, I was trying jerk anywhere we went–roadside stops, local restaurants and bars. 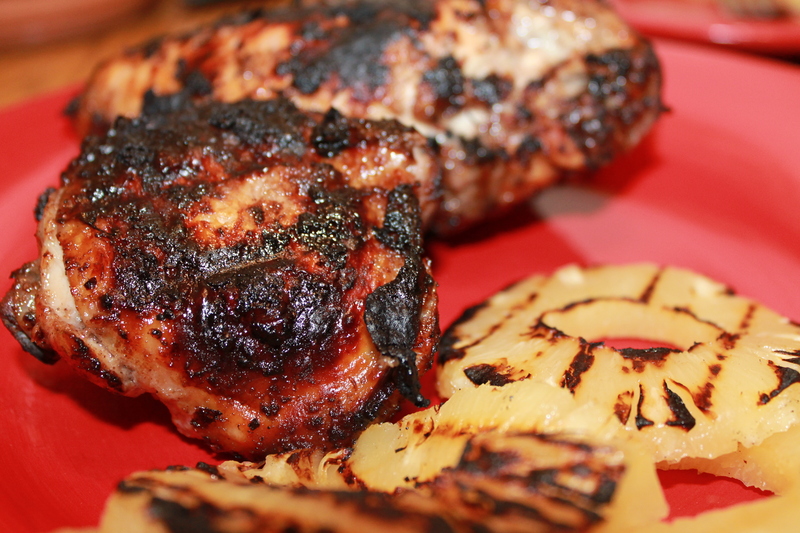 I love jerk– the spiciness, the complexity of the flavors melding together, the slightly charred bits. I love BBQ– I blame it on my Kansas City, Missouri roots (if you don’t know, KC loves it some BBQ). I do typically prefer a classic KC bbq– slow-roasted with a sweet but spicy tomato-based sauce. Jerk is a totally different type of bbq than I’m used to, but it’s still pretty fantastic. After some recipe trial and error, I’ve come up with the following recipe. Not super authentic, but it works in a pinch. One of these days, I’ll figure out how to make it with pork. 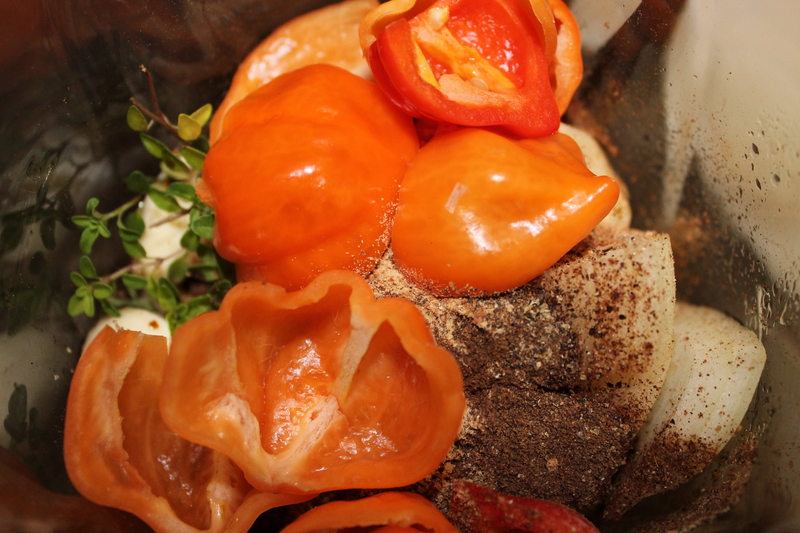 Traditionally, jerk is slow cooked over pimento wood–almost smoked. My apartment balcony barbecue doesn’t have the capacity to smoke, so I use a gas grill. Throw all ingredients except for chicken in a blender. Blend until smooth. Put chicken and marinade in a zipper plastic bag. Leave for at least one day, turning once in while. Grill on a greased grill, medium-low heat. 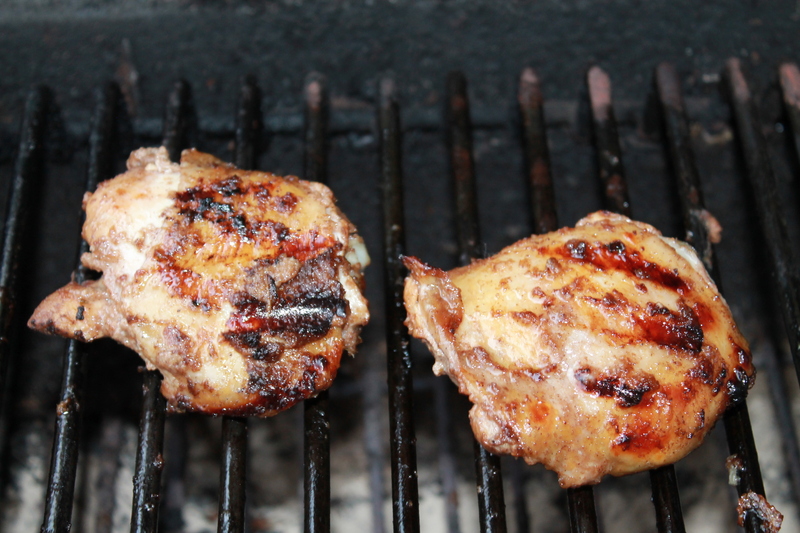 To keep it more moist, I usually start with the chicken in foil to keep it from drying out on the gas grill. If you have a charcoal grill or smoker– even better! Once the chicken is nearly cooked, I move it onto the flames directly and crank the heat up to give it a nice, blackened look. Serve with watermelon, grilled pineapple or any other tropical fruits you like. Drink a rum and ginger beer. Yes, we know the great Bob Marley, especially this classic that has been covered by Eric Clapton and N.A.S.A./Karen O.